I’m not quite sure yet what to make of Final Crisis #1. It wasn’t another mind-numbing crapfest like I’ve come to expect from Grant Morrison, which means I’m not rejecting the rest of the story off-hand (like I did with All-Star Superman and Batman RIP). Then again, it didn’t really do anything to make me care about Final Crisis more than I did before I bought the issue. Let’s get the good stuff out of the way first. The art was gorgeous. I’ve never seen any of J.G. Jones’ sequential stuff before, but I was really impressed. I think I’m definitely going to have to check out his work on Wanted (although I might steer clear of Morrison’s Marvel Boy). I’m glad that recently happenings in the DC Universe haven’t just been completely ignored by Morrison, even if he didn’t get all of his facts straight. I’m especially glad Countdown, The Death of the New Gods and Salvation Run were actually brought into the story. Even if those series weren’t exactly “good” or “readable,” it’s nice to know that they weren’t a complete waste of time. 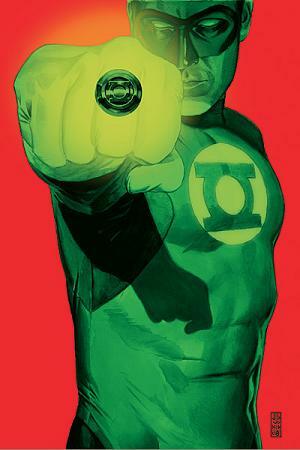 And I never thought I’d see the Alpha Lanterns outside of a Green Lantern title. Now for the bad. Morrison needs to get some original ideas. The biggest complaint I’ve heard so far about FC is, “All the villains are teaming up again? That’s like the fourth time in three years.” I’ll go you one better. This is the second consecutive Crisis that started with Martian Manhunter seemingly being killed by a character that hasn’t been seen in a DC comic for twenty years. It happened here with Libra, and it happened two years ago when Superboy-Prime blew up the Watchtower with J’onn J’onzz inside. Morrison also needs to pay more attention. The Monitor of Earth-51 wasn’t exactly “negligent” for letting his Earth die. Superman-Prime, Monarch, Solomon, Monarch’s army and all the rest of the Monitors played a pretty crucial role in that one, and the Monitors should know that (unless these nigh-omnipotent beings can’t monitor and fight at the same time). Besides, Earth-51 isn’t even dead, it’s just post-apocalyptic. And the New Gods have been dying for quite some time, so why is it that GLs are just now being called in to investigate deicides? At least three New Gods have recently died on Earth alone, including Big Barda, Knockout and Darkseid. Oh wait, I guess he’s not dead anymore. That’s where my chips are, ladies and gentlemen. It looks like Countdown’s sales crept up there at the end. Based on that curve and the close to 52, I can only assume that the final issue will continue that trend. Best guess? Maybe Countdown’s closing upswing is more consistent than 52’s because Countdown was leading to Final Crisis — not that Grant Morrison was aware of that, mind you (for more on that, check out our Book of Doom review of Final Crisis #1 this weekend). But the idea, true or not, that the final issues of Countdown were a primer of what was to come might explain why readers consistently came back to the series in its waning days. Continuing the system of letting the Avengers books fill in the blanks of the main title, New Avengers #41 is set alongside the Savage Land battle seen in Secret Invasion #2. Spider-Man gets tossed by a T-Rex into the jungle, where he encounters Ka-Zar, Shanna and some other of those Tarzanesque people, most notably including either Sauron or a Sauron lookalike. I know that some people are getting really tired of the “You’re a Skrull!” “No, you’re a Skrull!” stuff, but it hasn’t worn on me yet. I think mainly because 1) it’s what would happen if the Earth were invaded by shape-shifters, and 2) it’s extra entertaining when Spider-Man is involved. They then flash back to the Ka-Zar family’s discovery of S.H.I.E.L.D. agents enslaving Savage Land inhabitants and mining vibranium, which they are not supposed to be doing. When they discover that the S.H.I.E.L.D. agents are Skrulls, Shanna tries to infiltrate the camp but is quickly discovered. One Skrull S.H.I.E.L.D. agent tells another “The only people that ever come to this part of the Earth are the Avengers and the X-Men … and they’ll come here when we tell them to.” She also says “We have agents inside the New Avengers.” Agents plural. Also, when the eventual Shanna-Skrull S.H.I.E.L.D. battle ensues, agents are ordered not to kill “it” — to mine Shanna for her DNA? Or is Shanna maybe a Skrull now too, explaining why they wouldn’t want to kill her and why she’s sowing so much paranoia. Anyway, Ka-Zar and Battle Cat save the day, and Shanna breaks down the big picture — the Skrulls have infiltrated S.H.I.E.L.D. and the Avengers, so there’s no one they can trust. If they’re going to save the Savage Land, they need to build their own army. When leading their new Savage Land army to take the fight to fake S.H.I.E.L.D., they witness the events of New Avengers #6 when possibly-real S.H.I.E.L.D., led by Maria Hill, came in and blew the whole thing up. The peacefulness of the situation ends as both Spider-Man and Shanna start to regain their paranoia, and then Space Ship Captain America bursts in to end the issue. I think, due to respect for Ed Brubaker’s ongoing story, and based on the fact that Cap didn’t turn into a Skrull when he died, we can probably assume this isn’t the real Captain America. As we saw last issue though, Skrull sleeper agents are led to believe that they really are who they’re bred to resemble, so it’s possible this Skrull really thinks he’s Captain America. At the same time, though, we also saw that there are some Skrulls in this space ship gang who know they’re Skrulls. I think the intrigue here will be in watching this Captain America come to terms with who he really is. The thing that was suspicious at the time was that the S.H.I.E.L.D. attack in New Avengers #6 killed a bunch of innocent Savage Land slaves and very nearly killed the New Avengers too. Even though it covered up their tracks, it wouldn’t make sense for that to be a Skrull attack, because the Skrull queen, who we now know was disguised as Spider-Woman, could have easily been killed. I don’t know if it was an error or if there are just multiple pterodactyl people, but in NA #6, Hill thanked the Avengers for helping get Sauron back in custody; there’s a Sauron lookalike with Ka-Zar and the gang in their NA #41 conversation with Spider-Man. Shanna overheard the S.H.I.E.L.D. agent said they have more than one infiltrator in the New Avengers. Granted, she could be referring to either Avengers team or both together, as it’s not like the adjectives are known or used by characters in the fictional world. But it’s safe to assume she meant the team that exists in the comic book marketed as the New Avengers, because the events that follow this observation happen in New Avengers #6, before the Mighty Avengers even existed. 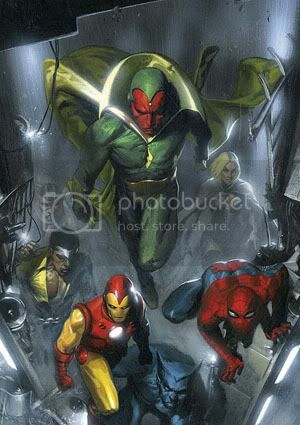 The New Avengers line-up at that time consisted of Spider-Woman, Iron Man, Spider-Man, Captain America and Luke Cage. Wolverine was with them, though not necessarily part of the team. Thanks to New Avengers #40, we know one of the Skrulls is Spider-Woman. Captain America has since died and not turned into a Skrull. Luke Cage is a definite possibility, as he’s instigated a lot of post Civil War activity. I’d say Spider-Man is safely Spider-Man, because that would just be too cheap of a way to get out of One More Day. Wolverine is probably a red herring, though it would make sense in some ways. Nick Fury seems to suspect him, according to Mighty Avengers #12. Wolverine’s first appearance in New Avengers was in issue #4, where he was conveniently already in the Savage Land. 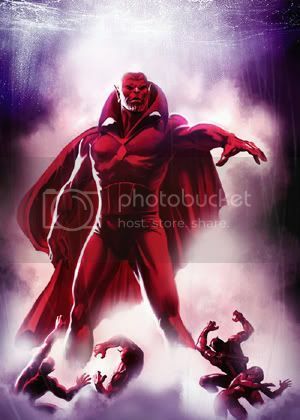 It’s reasonable that a Skrull would take his shape to gain access into the group. 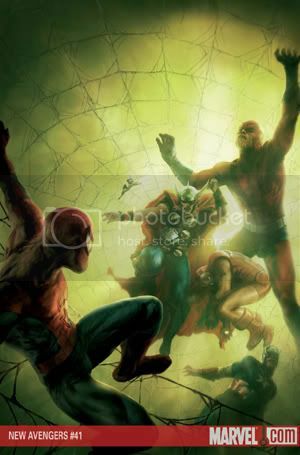 Problem is, he makes his appearance getting the jump on Spider-Woman. The sleeper agent defense doesn’t work, as the only way a Skrull Wolverine would make sense in this situation is if he were knowingly trying to infiltrate at that point. He was acting suspicious in SI #1, but he also saved Echo from a Skrull in New Avengers #39. That leaves Iron Man and Luke Cage, and possibly Jessica Jones. Recall the S.H.I.E.L.D. agent said “…they’ll come [to the Savage Land] when we tell them to.” In Secret Invasion #1, Spider-Woman calls Luke Cage in order to get the New Avengers there. At the very least, that implicates Spider-Woman, but it could hint that Luke Cage was part of the scheme to get everyone there. Either that, or she just felt he would be the easiest to manipulate. Mighty Avengers #14 continues the pattern of using the Avengers books to fill in details alongside the core Secret Invasion issues. This story starts out in the past, with The Sentry single-handedly stopping an invading Skrull ship. He attempts to confront them before they destroy their ship. The explosion knocks him out, after which he wakes up under the care of Reed Richards and The Thing, who explain Skrulls to him in a nutshell. There was a little bit of weirdness to it that kind of reminded me of the hospital scenes in New Avengers #40, where the Skrulls attempt to acclimate the sleeper agents to their new identities. I have mixed feelings about this issue. I read it twice. The first time I read it, I thought it was awful. The second time I read it, I still thought it was awful, but I tried to think about why I thought it was awful, and in doing so, I found myself faulting the book for things that, on paper, I think I should like. I think I should like that Morrison has been building up a big story over a long period of time. I think I should like that he’s introducing new villains rather than relying on the long-established and potentially tired ones. When he does use an established villain, he uses the Joker, and it seems to be set up in a way that suggests a big battle is coming up so we have that sense of building anticipation. But none of it worked on me. Rather than unfolding organically, this story seems forced. 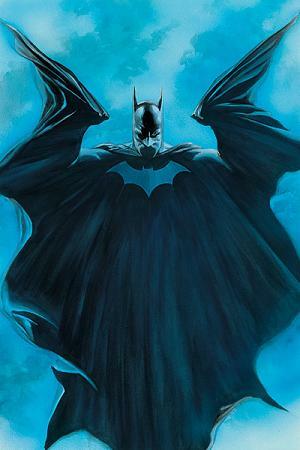 Morrison’s run on Batman so far has at times been fun (I enjoyed the “League of Heroes” storyline, where Batman and friends were trapped in the mansion) but it’s also been awful (I have disliked far more of these issues than I’ve liked). Rather than having a story unfold out of Batman’s life, his distribution of the early pieces of the story feel abruptly jarred into place. Instead of watching something develop, the readers just have to suffer through crap knowing that the writer is up to something. I groaned when I saw the spread of villains. I don’t know if any of these people are established, but they are new to me, and I don’t know if you could come up with a more predictable band of Grant Morrison villains if you tried. Oooh, a killer mime. A luchador in a suit! Too cute by half. And when we get the actual Batman and Robin, it’s worse than reading Frank Miller’s take because at least he is operating in an alternate world. Morrison just does whatever he wants, even though he’s working with the official versions. The Batmobile has a CD changer? Stupid. Robin is throwing a temper tantrum because Bruce has a son? Awful. There seemed to be a deliberate attempt to depict Tim Drake as having grown up a bit, but that went completely out the window when he was sulking about Damien. That Joker scene at the end seemed to ooze pride in how it clearly didn’t make sense. But it wasn’t intriguing. It was stupid. The Joker doesn’t look cool wearing a dress. And when did his face become all scarred? Did that happen in Salvation Run? Or is Salvation Run just not acknowledged by Grant Morrison? It’s all so dumb. It’s not rewarding to read. These questions the book raises aren’t intriguing, they’re annoying. Oh and the art is terrible. It’s stiff and amateurish. If you’re going to kill Batman, at least give the job to someone decent. I really hope this storyline isn’t as important as they’re making it out to be, because I really don’t want to read it. Let’s see if Fin Fang Doom liked it any more than I did. I’ve never really been a fan of Grant Morrison. Despite his status as an A-list creator, I can’t think of a single project of his outside of New X-Men that I’ve really enjoyed. Morrison’s Batman is particularly bad. Well, at least his first arc was, because that’s as long as I could stand to read it. So naturally I had no plans to read Batman R.I.P. I know DC’s not going to kill off Batman, so right off the bat the story seems a little pointless. And with Final Crisis starting up right at the same time, I don’t need another major storyline to waste my money on. Plus, seeing as how the story is contained within Morrison’s Batman run, it’ll be easily avoidable. I wrote the following blog several months ago when thinking about the pairing of Final Crisis with Grant Morrison. I decided to shelve it, thinking I was maybe being too harsh. After reading part 1 of Batman R.I.P. today and flipping through the Final Crisis Sketchbook, I decided to revive it. Both of these big events look like self-indulgent messes that are less about telling engaging stories than they are about a celebrity writer getting free reign to be as cute as he wants to be. I’ll be very happy if I’m proven wrong, but the first part of Batman R.I.P. and several pages of Japanese superheroes and New Gods-related characters in the Final Crisis sketchbook did not make me excited about what’s to come. 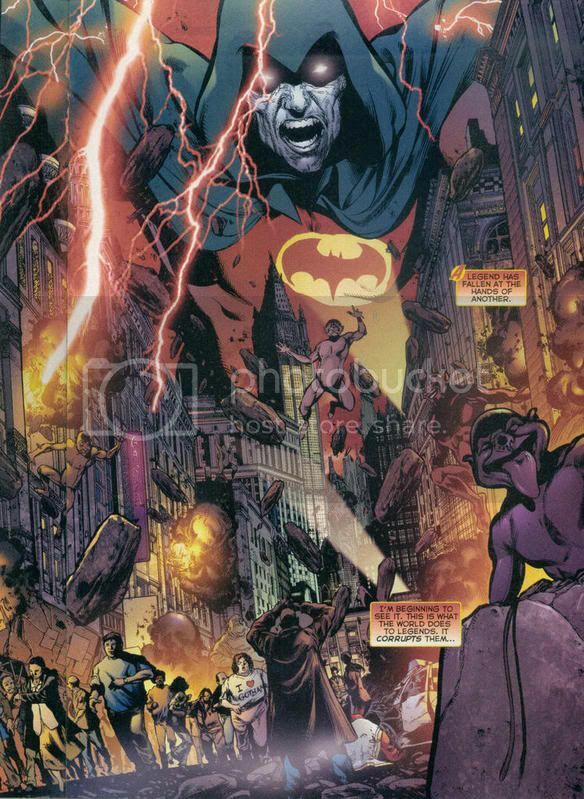 Let me go on record and say that, in spite of my moaning about the awfulness of Countdown, I would very much like Final Crisis to be a huge critical success. I don’t like hating comics. I don’t like wasting my money in $2.99 increments each week. I really want to like it. But man, are the signs not pointing to something good. 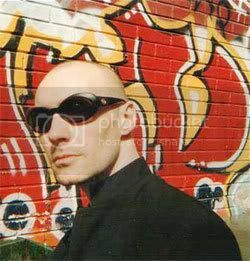 I was excited when I heard that Grant Morrison was doing the writing, because I considered him to be among the current comics writing geniuses. As time has passed, I pondered that I also at one point considered Paul Dini to be a creative genius, and look how unpredictably awful Countdown has become. So I thought it worth considering what exactly Final Crisis is. Captain America’s shield in Iron Man? Continuing Doomkopf.com’s transformation into an exclusively-Iron Man comics blog, here are some entertaining little bits on an alleged Easter Egg. FIRSTSHOWING.NET: Is that Captain America’s shield in the background of the Iron Man movie? I have confirmed myself, along with our comic book expert Roman Chavez, in person that Captain America’s shield is actually in Iron Man. Yes, you heard me right, and if you need to go out and see it again this weekend I suggest you do. We’ll provide the information on when and where it shows up below if you care to go find it, but we’re pretty damn sure this is it. As for what this means for the Marvel universe and future movies – who knows? I thought Captain America wasn’t around at this time and I thought he got his shield from S.H.I.E.L.D.? TOYRSEVIL.BLOGSPOT.COM points out that the shield was clearly added for the theatrical release, as it is absent from the trailer version of the same shot. Two Secret Invasion books came out this week — Secret Invasion #2 and Mighty Avengers #13. Secret Invasion #2 starts off in the Savage Land with the superheroes from the Skrull ship facing off against the combined New and Mighty Avengers. Both sides accuse the others of being Skrulls. Ares warns his teammates that it’s a trap, but no one listens to him. It seems reasonable, but in a situation like that, I’d imagine it’s hard to know who to listen to. Obviously, a fight breaks out. Tony Stark is helpless, as his armor has completely failed thanks to the virus Jarvis unleashed in issue #1. Carol Danvers flies him out of the fight while everyone else attacks each other, taking on their counterpart when available. The intrigue to the situation is obviously entertaining the thought of “What if these are all the originals, and the reason Clint Barton came back from the dead … and the White Queen turned good … and the Scarlet Witch turned bad … what if all those implausible things happened because the people we thought we knew had been replaced by Skrulls?” It’s where the intrigue of the Skrull invasion comes from, but unfortunately, it’s dampened to a degree when we see the shipwrecked Vision do a little shape-change to freak out The Sentry. So right off, it’s made clear that some of this gang are Skrulls. The question then becomes how many of them are Skrulls, if not all of them.